After one week, hunger finally drove Owen Syllavan out of his hiding place in the Connecticut woods and forced him to seek refuge with an acquaintance. Syllavan cut open a plank in the floor of his friend’s house, dug a large cavity that went under the hearth of the fireplace, and rigged a vent so that the smoke from his own makeshift fireplace would go up the main chimney. 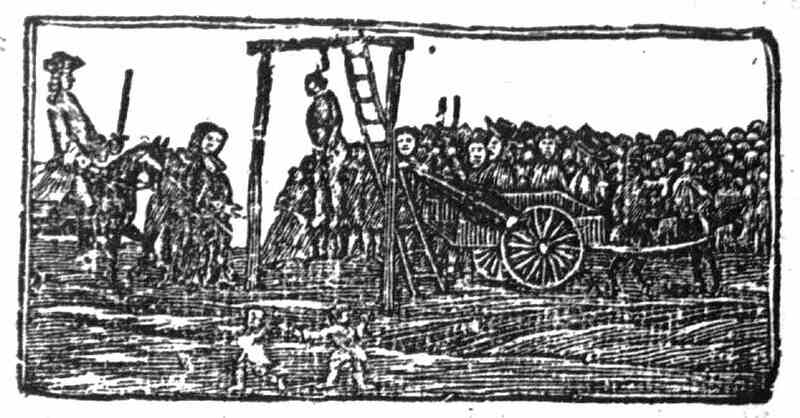 As Syllavan sat in the dark in 1756 with only the fire in his chimney for light, he must have reflected on how he had come to be lying in a hole in the ground and perhaps about how his present situation was not unlike a scene from his childhood. Owen Syllavan was born near the town of Fethard, Ireland and admits that from a young age, he was “always in all kinds of mischief; so that I never minded Father or Mother, Sister nor Brother; but went on in all Manner of Vice.” When he was eleven, his parents became so fed up with his behavior that they locked in a room for a period of time and fed him only bread and water. But the punishment failed to have its effect, because when Syllavan finally gained his liberty, he was “ten times worse” than he was before. Exasperated, his parents sent him away to live with a strict schoolmaster. Syllavan’s real name was John, and as if to underscore this point, an evil spirit began to visit him while he slept at the schoolmaster’s house and repeatedly called his name, “John, John, John.” This chant would go on for several minutes at a time throughout the night. The visitations continued three nights in a row, so the schoolmaster began to stay with Syllavan in his room. But the spirit kept appearing. Ministers were brought in. People prayed. They tried moving Syllavan to another house. All to no avail. As soon as the clock hit eleven o’clock, the spirit began calling, “John, John, John.” Syllavan became sick, and the sounds of the spirit began to grow. Finally, Syllavan was returned home, but this time the spirit did not follow him. Syllavan continued his evil ways until at the age of thirteen he left the “tyranny” of his parents and ran away. He came upon some men who were about to sail to Waterford, and when he asked them to take him there so that he could visit his aunt, he told the men his name was Owen Syllavan. The name stuck, although at other times he went by John Brown and John Livingston (whether either of these last names was his real one is not known). Syllavan continued to travel around Ireland until he met a man on the road who asked him where he was from. Syllavan answered that he was from Dublin and, his poor parents being dead, that he was travelling to Cork to see if he could find any of his relatives. The man told Syllavan that if he agreed to live with him instead, that he would be his “friend and relation too.” Syllavan ended up going back to the man’s house, where he indentured himself to him for seven years and became the foot-page of the man’s wife. After serving the family for six years, Syllavan suddenly became homesick, so when his master asked him to deliver a letter one day, Syllavan used the opportunity to run away. He ended up back at Waterford, but never made it back to his parents. 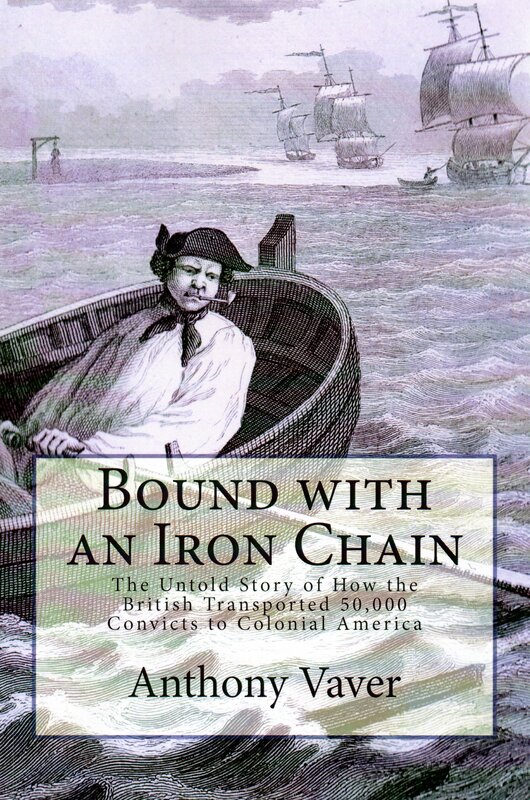 Instead, he once again bound himself as an indentured servant–this time for four years on a ship headed to Boston. The trip lasted nine weeks, and there were not enough provisions on board to satisfy the number of people who had signed up for the trip. Syllavan was desperately hungry, so he offered to give the captain three more years of his service in exchange for all the biscuits he could eat within a specified time span. The captain laughed and agreed to the bargain, although he added the condition that Syllavan could not drink anything within that time frame. After the ship arrived in Boston, Syllavan was sold to a man who lived in St. George in what is now Maine. He spent two and a half years clearing land and chopping wood, until the family moved to Boston in fear of the French and Indian War. Syllavan’s owner sold his remaining time to a captain, and Syllavan spent the next two years serving as a soldier. He then reenlisted in the army against the wishes of his master and eventually became the chief armorer, where he learned to engrave guns. Syllavan enjoyed the rigors of the army, and his rising success prompted him to get married. The marriage turned out to be disastrous. The two newlyweds began to drink too much, and “through her aggravating Tongue,” he began to neglect his duties and was demoted to a common soldier. Syllavan used his time off-duty to practice his skills as a silversmith. One day, he cast a Spanish dollar, and absent-mindedly left it out on his workbench. Someone saw the coin and turned him in for counterfeiting. He was tried in front of a court marshal and even though he pled guilty to making the coin, he was acquitted. Later, he quarreled with a fellow soldier and received fifty lashes as punishment. Syllavan’s regiment broke up around the end of 1748, so he set up an engraving business in Boston. One day, two men asked him to engrave a plate that could be used to print New Hampshire money and paid him well for doing so. In the belief that he had stumbled upon “an easy way of getting money,” Syllavan started to counterfeit Boston bills of credit. Neighbors watched as Syllavan began to live large, but they also noticed that his expenses never seemed to match his income. Then Syllavan’s wife inadvertently cried out during an argument, “Hey, you Forty Thousand Money-Maker.” The neighbors overheard the remark, and they lodged a complaint. When the authorities searched Syllavan’s workshop, they discovered a mold for casting dollars, ink, copperplate, and pieces of paper on which Syllavan had practiced imitating the signatures on bills of credit. Syllavan was immediately arrested and put in jail. While Syllavan was in confinement, he used his free time to engrave three plates that could be used to print New Hampshire and Boston money. He then sold the plates to a friend in exchange for help in getting him out of prison. As a result Syllavan was released on bail, but he was soon found guilty of committing forgery. 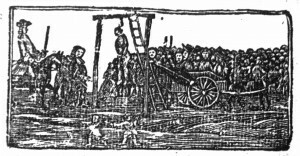 As punishment, he stood two hours in the pillory and received twenty lashes at the whipping post. After his release, the two men who originally commissioned the New Hampshire plates from Syllavan were caught holding counterfeit money. In an attempt to save themselves, they both “turned King’s evidence” by offering to provide testimony against the engraver, but Syllavan managed to escape capture and fled to Rhode Island. While in Rhode Island, Syllavan returned to his counterfeiting business and added several accomplices to his operation. With their aid, he printed and distributed 12,000 pounds of Rhode Island money, but the wife of one of his partners was caught passing some of the counterfeit bills, which threatened to bring down the whole operation. Syllavan tried to protect his associates by telling them to claim that they believed the counterfeit money they received from him to be real, but one member of the group, Nicholas Stephens, decided to protect himself by giving evidence against the others. Stephens’s plan backfired. Syllavan’s confederates held firm to their story, and Syllavan backed them up by pleading guilty and maintaining that he had cheated them without their knowledge. As a result, both Stephens and Syllavan were found guilty and sentenced to branding on both cheeks with an “R,” cropping of their ears, and imprisonment. 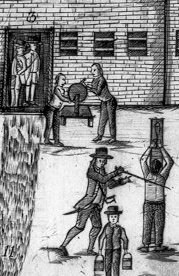 Syllavan charmed the public and his captors so much that not only was his corporal punishment inflicted in such a light manner that it barely showed, but he was so casually guarded that he broke free from the guards, grabbed a cutlass, and used it to encourage the executioner to administer Stephens’s punishment to its full effect. Syllavan escaped several times during his imprisonment and on his last attempt fled to Dutchess County, New York. In New York, Syllavan formed a new gang of counterfeiters, and since they were centered in the town of Dover, they became known as the Dover Money Club. Almost all of the members had a crop or brand mark, which they wore with honor, since the marks indicated that they were seasoned in their field. By this time, Syllavan was an accomplished engraver, and he produced high quality bills that were almost impossible to distinguish from the originals. The Club developed an extensive network of passers and agents throughout Connecticut, Rhode Island, and New York, and Syllavan traveled throughout New England printing bills for Club associates. But Syllavan had become quarrelsome and demanding, and he was rarely sober. In addition, the extensive activities of the gang were beginning to catch the notice of the authorities. 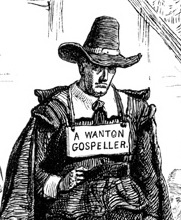 In early 1756, someone recognized Syllavan and his gang hanging out in western Connecticut and reported them. The authorities swooped in and began arresting the members of the Club. But Syllavan learned what was happening before they could capture him. He retreated into a wood near a swamp and then into the mountains, before ending up in the bunker he had dug under his friend’s house. While Syllavan hid underground, several men arrived looking for him. The owners of the house denied any knowledge of his whereabouts, but one of the men discovered some newly moved dirt, so they began a more diligent search. They entered a bedroom where a woman was presumably sleeping, moved the bed to the side with the woman still in it, and discovered a loose plank that was cut in two. After the men removed the plank, Syllavan emerged from the earthen cavity and surrendered. Syllavan was first taken to the New Haven jail and then transferred to New York, where he was tried, found guilty, and sentenced to execution. He took pride in the fact that even though his accomplices deserved the same fate as him, that he did not betray any of them. 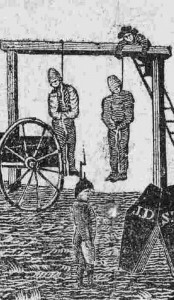 At his execution on Monday, May 10, 1756, he expressed hope that his associates would destroy all of their money, plates, and counterfeiting accessories, so that they would not meet a similar end. Syllavan essentially received his wish. Only one other gang member out of the 29 in the group was ever punished, with the rest either eluding capture, escaping after arrest, or receiving acquittals due to a lack of evidence. [Advertisement]. Boston Evening Post, June 7, 1756, issue 1084, Supplement p. 1. Database: America’s Historical Newspapers, Readex/Newsbank. “Boston.” Boston News-Letter, September 13, 1750, issue 2522, p. 2. Database: America’s Historical Newspapers, Readex/Newsbank. “Boston, 14, September 1750.” Boston Evening-Post, September 17, 1750, issue 788, p. 2. Database: America’s Historical Newspapers, Readex/Newsbank. “Newport, August 14, 1752.” Boston Post-Boy, August 17, 1752, issue 921, p. 2. Database: America’s Historical Newspapers, Readex/Newsbank. “New York, May 17.” Boston Gazette, May 24, 1756, issue 60, p. 2. Database: America’s Historical Newspapers, Readex/Newsbank. Scott, Kenneth. 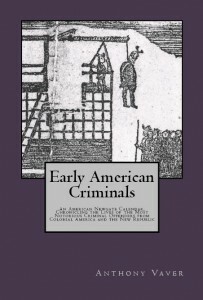 Counterfeiting in Colonial America. New York: Oxford University Press, 1957. Syllavan, Owen. A Short Account of the Life of John *********, alias Owen Syllavan. Boston: Green & Russell, 1756. Database: America’s Historical Imprints, Readex/Newsbank. This was written by Anthony Vaver. Posted on Thursday, October 20, 2011, at 11:57 am. Filed under Criminals. 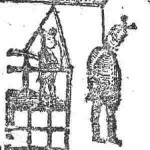 Tagged Branding, Connecticut, Counterfeiting, Ear cropping, Execution, Forgery, Imprisonment, Maine, Massachusetts, New England, New Hampshire, New York, Pillory, Punishment, Whipping. Bookmark the permalink. Follow comments here with the RSS feed. Post a comment or leave a trackback.